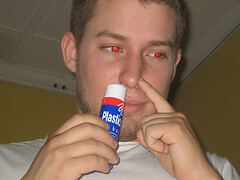 Is it against the law to sniff glue or paint? When fourteen-year-old Randy tried to get high with his friends, he made the headlines: “Teen Dies After Sniffing ScotchGuard.” He lost consciousness while sniffing the fumes of a common household spray. Inhalant abuse causes approximately 100–125 deaths in the U.S. each year. A 2003 survey of high school seniors revealed that 4.5% had used inhalants in the last year. 12% of the seniors admitted to having used inhalants in their lifetime. Teenagers and kids are experimenting more and more with inhaling everything from glue to spray paint, gasoline, lighter fluid, paint thinner, and air fresheners. Other household products that contain breathable vapors include shoe polish, typewriter correction fluid, hair spray, and bug killers. The vapors or fumes from these products starve the body of oxygen, which causes damage to the brain and nervous system and sometimes leads to death. Brain cells killed by sniffing substances can′t be replaced, and frequent users often undergo personality changes. States have laws against inhaling toxic vapors. If you′re caught sniffing, you may be locked up until counseling begins. Passing laws against the use or purchase of these products by minors is helping, but it hasn′t solved the problem. Dear Ashleigh: Medical studies show that the chemicals in glue and other household products kill brain cells that don’t regenerate. In other words, once the damage is done, it can’t be repaired or reversed. Think twice before inhaling any non-medical substance. (This is information only – not legal advice). Dear Jenny: We’re so sorry for your loss. We hope to educate youth about the dangers of using toxic substances and to help prevent future tragedies from occurring.